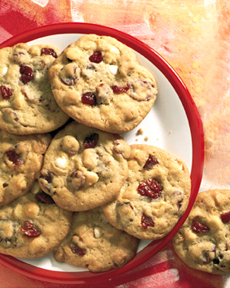 A tasty turn on the usual chocolate chip cookie includes delicious dried cherries. The recipe is on the next page. For Washington’s Birthday Or Any Day! CAPSULE REPORT: Even though George Washington never chopped down a cherry tree, the legend is stronger than the truth. Cherries are part of any Washington’s Birthday celebration, and there’s no better way to enjoy them than in cherry chocolate chip cookies! This is Page 1 of a three-page article. Click on the black links below to visit other pages. George Washington (1732-1799) was born on February 22, and we’ve been celebrating his birthday* since 1885, when President Chester A. Arthur signed a bill establishing it as a federal holiday (it was Abraham Lincoln [1861-1865] who had previously established the concept of Federal holidays). George Washington commanded the Continental Army and led it to victory against the superior-armed British forces in the Revolutionary War. As our first president, he was the statesman who led the fledgling United States of America in its earliest days. A trained surveyor, Washington was a gentleman farmer. After service to his country, he returned to his farm, Mount Vernon, in Virginia. The story of Washington chopping down a cherry tree in his youth is not true in the least: It was invented by an early biographer of Washington, Parson Mason Weems. Yet, the myth was taught to schoolchildren for hundreds of years, and became such a part of the legend of the “Father Of Our Country” that February was declared National Cherry Month (cherry season is July). George Washington never had a chocolate chip cookie either: Chocolate for eating wasn’t invented until 1847. Prior to then, chocolate was only consumed as a beverage, hot chocolate. And the chocolate chip cookie wasn’t invented until 1937 (see the History Of The Chocolate Chip Cookie). But that’s no reason why we can’t enjoy eating the legend, in the form of a delicious cherry chocolate chip cookie, to celebrate Washington’s birthday in February or at any other time of the year. There are more facts about how the Washington’s Birthday holiday was created on Page 3 of this article. Add 1/2 cup of dried cherries to your chocolate chip cookie dough. If you don’t have a recipe, we like the recipe on the next page. 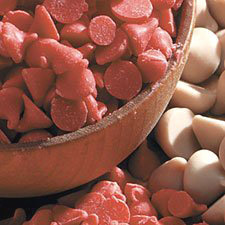 You also can try a version with cherry chips, dividing the chips in the recipe between chocolate chips and cherry chips. And you can even add 1/4 cup of dried cherries to that. These cherry chips are available at baking supply stores.